Some time ago I blogged about the unfortunate mockingbird nest that was discovered by the neighborhood crows. The nest was picked clean by a large grim reaper of the bird world, the American Crow. I was sad as the mockers had given up a small roebelenii palm a foot off my pool deck, that they nested in twice last year for a small bush in the neighbors cat infested, unprotected yard. Perhaps they learned their lesson. 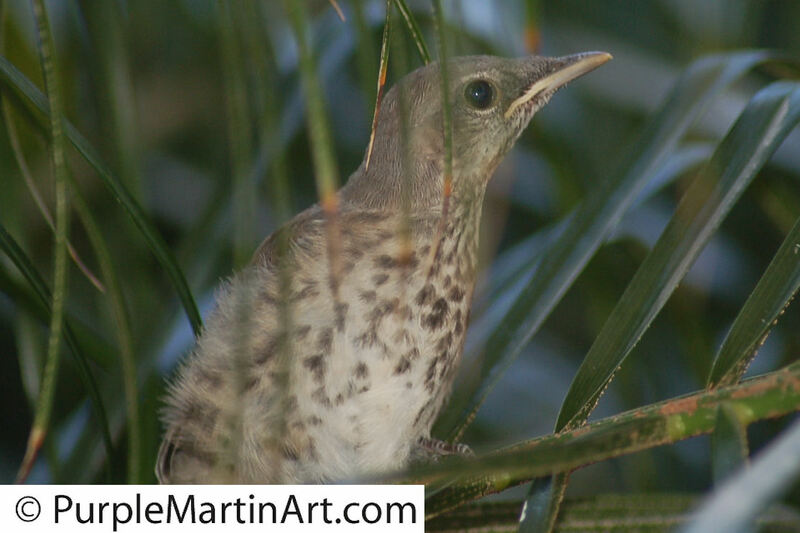 Perhaps it is a different pair, but they have a young fledgling making his way out of another nest in a Roebelenii palm just outside my front door. They go berserk when my dog goes out the door for his “work” but are nonplussed by me going outside to check on them. As I went outside the door one morning I heard the parents giving their little worried call to the fledgling. The parents were up on the rain gutter looking down at me. It sounds like a soft short moan. Not an alert call at all. I looked around and there in the palm a foot from my head was the baby. Looking at me. I got my camera and took some pics of the little guy and remembered the mockingbirds of my youth and how they would have scalped me in short order if I had ever wandered so close to their baby. I am sure they know that I am a protector not a threat. 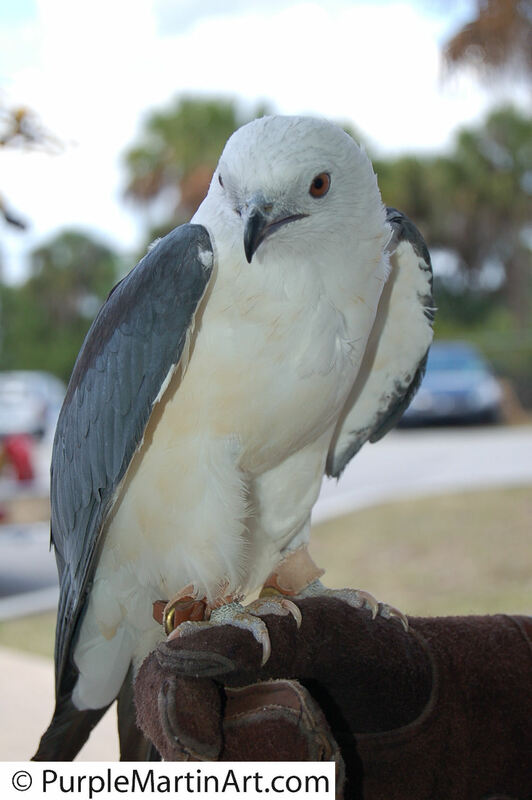 A recent study by the University of Florida that was reported in the Proceedings Of The National Academy of Sciences showed that the mockingbirds DO recognize individual people, after as little as two encounters! Read about the study here. 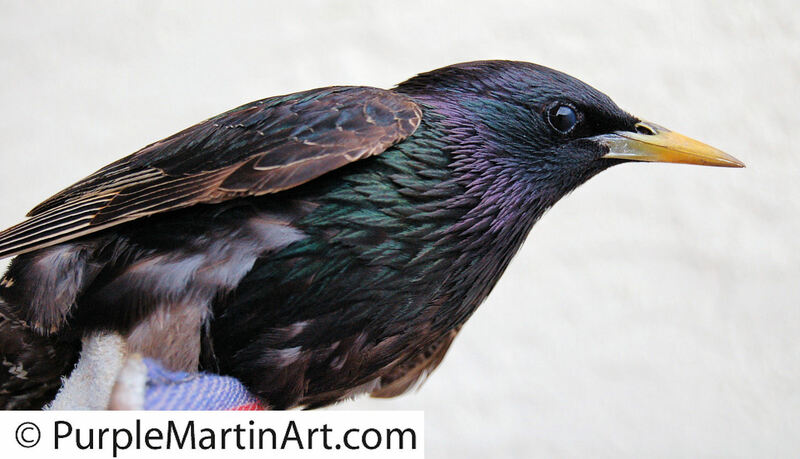 My thoughts of course ALWAYS travel back to the Purple Martins and I am sure that the same science can be applied to the martins as well. My only question is when will that ASY male martin STOP dive bombing me? I am starting to have my feelings hurt. Me? A threat? The pregnant clouds finally broke their water and the rain has been relentless for the last 3 days. 5 minutes of sunshine then another “contraction” in the form of thunderstorms. I am glad and the birds seem to be handling the frequent downpours well. There is enough pause between and the storms are scattered enough that they are feeding just fine. A nest check is overdue on all racks and if the thunder stays away while the kids are napping, I may try to squeeze one in today. The earliest of fledglings seem to still be returning to the gourds at night to sleep but it is hard to determine just what is going on. The other night on the nest cam I noticed what seemed to be 3 adults in with the 5 nestlings in Gourd #4. They were all sleeping peacefully but I doubt that was the case when the party crasher arrived. The fledglings are clambering all over the gourd racks and the house causing a ruckus all day long. The rain has been falling on and off for the last 2 days and they seem to be enjoying the it. All it takes is me stepping on to the back patio and I set them off in a slurry of purple. The flock moves en Mass except for the remaining parents that are still feeding nestlings. More than half of the nests have fledged and my season will be starting to wind down shortly. The Red Shouldered hawk is persistently attacking the colony and I can only assume that it has been successful, though thankfully I have yet to witness a successful attack. Yesterday I witnessed 3 such attempts that set the purple martin off in an alarming cacophony. I am sure that now having said that, I have jinxed myself and come tomorrow morning I will see the blasted hawk plucking a martin right before my eyes. Please knock on wood! I have had so many “firsts” this year. First snake attack. First dead nestling on the ground. First pair to actually nest in the gourd hanging on the 5 foot shepherds hook. First nest check with my son. First time broadcasting the webcams. Never mind all the milestones and “firsts” with the website and blog. I already am missing my birds and can’t wait to show them again next year what a wonderful place this is to call home. Purple Martins on Nestcam gourd #11 have fledged! It is official, they are flying around like maniacs. A bit unsteady but apparently without incident. The Nestcam was so dirty that it was hard to make out who was even in the gourd. I finally brought myself to lower the rack and in doing so flushed out a few straggler fledglings from gourds #11 and 12 but it had to be done. At approx 31 days old, I knew they would be fine. The Nestcam is now cleaned off and on gourd #4 which needs a watchful eye as I have not seen daddy helping and mom seems to be taking her time with feedings. The babies did not seem as plump as I would like and they seemed a bit bony so I will be watching this gourd closely to make sure that they are getting enough to eat. Two of the nests are down right nasty and if it were not for a clutch of new eggs in gourd #8 (a renest attempt) I would have done a nest change. This was the first nest check for the numbered gourd rack in over a week so a complete check was long overdue. But to do a full nest check and then do a nest change also would take too much time. The nastiest of the nests is due to fledge within a week so I am considering leaving it be. OR I may go out tomorrow and bring the rack down and change the nesting material. I hate the thought of them in that mess. Under the lettered gourd rack, I found a dead nestling. Approx 4 days old and it had been dead quite some time. It came from gourd H and the other 5 nestlings in the gourd seemed fine. The are about 8 days old. I will never know what was the cause. An SY male perhaps or just a case of natural death and the parents cleaning house. I am unable to check the telescopic pole as the nestlings in the aluminum Sunset Inn house are ready to fledge at any time. In other news: There is lots of racoon feces on our patio and I am starting to get more nervous. A flicker has been cleaning out the screech Owl box since the owls are gone and one of the tidbits it threw out was a whole owl egg. I fear the owls did not have a successful clutch in my yard. I officially have given up on European Starling hunting. I instead, am putting up my old plastic martin house, under the eaves of the house and offering it up to the starlings, as a fine place to make a nest and raise young. Hopefully they will be done teaching their little demon spawn to forage and will be on the look out for more housing and I will comply. Am I nuts? No, but there is a method to my madness. Listen and I will tell you. My pellet gun skills are not even worth the effort. At this point it seems useless to just “make noise” and chase them from the cross-hairs of my yard to the safety of the neighbors only a few feet away. Dozens of Starlings everyday come and feed off my lawn, which in reality is not that many considering starlings have been know to gather in flocks of thousands. But I digress. No longer will I scare them away. Hopefully I will entice a pair to nest in the old house under the eaves. I will let them lay eggs and maybe even hatch them. At some point I will take over the raising of one of their young and make it a fine pet. Maybe even teach it to talk. I will teach it to say something quite clever, I am convinced. 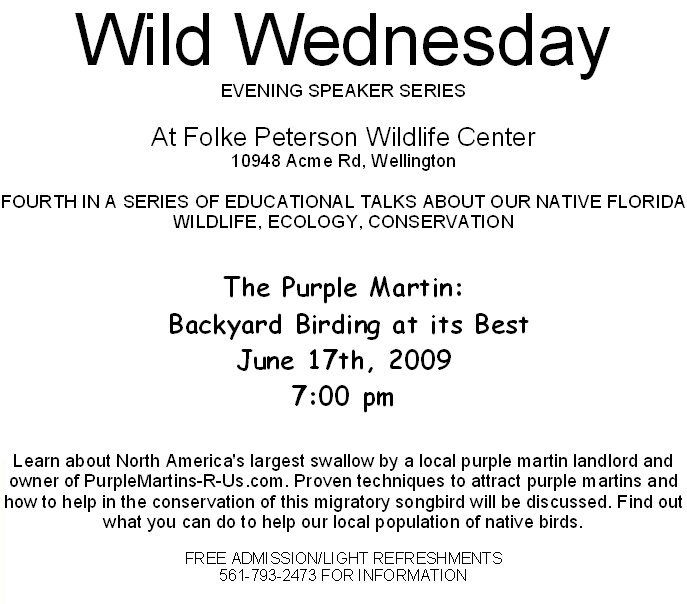 Maybe even take it with me when I do purple martin presentations. Since they are invasive pests they are not protected by law and I can do this. 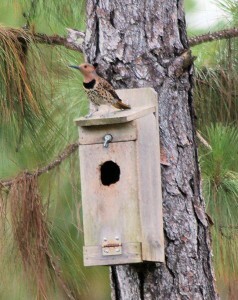 Then my new pet will be the decoy to call other starlings to my “starling motel”. The Starling Motel is owned and operated by the same infamous motel chain that owns the roach motel. Perhaps you have heard of them? Like the Roach Motel, the starling motel will also not allow check-outs. 2 days of pregnant clouds and not a drop of water. The neighborhood ponds are drying up and the wetlands at some of the areas of Grassy Waters Preserve look more like scrub land than swamp. For hours the sky was black and thunder could be heard in the distance. The clouds swirled but not a drop fell here. It seems like there has been a bustle of morning hour activity at the purple martin housing ever since the babies have started fledging last week. I am not sure if some of the activity is from other area colonies or my own purple martins. They swoop in with zest and proceed to make themselves quite the nuisance. Peeking in compartments, being scolded fiercely by protective parents, vocal and joyful in both song and flight they are everything that is fun to watch about purple martins. Though a bit mischievous, I have witnessed no serious fighting. 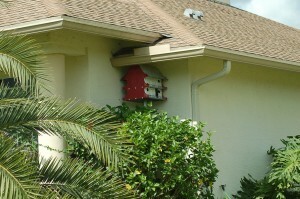 The nestlings on the nestcamare big and ready to go at any time. They are busy flapping about in the gourd, stretching and preening their new flight feathers. Preparing themselves for a maiden flight. There is always at least one with its head looking out the front of the gourd and the others stuck inside looking about or napping. Today they are 26 days old and they are officially old enough to fledge at any moment. The mother comes to the opening and perches for some time often bringing no food, which signals that they are indeed ready. 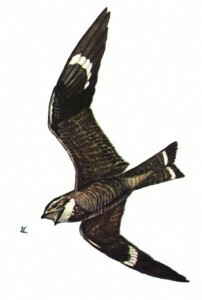 The parents will decrease feeding as fledging approaches. This technique serves 2 purposes. First, it decreases the attractiveness of the nest with its “room service” so that the babies will want to come out to feed. Secondly, to decrease their weight which can be more than an adults. Talk about baby fat! Try getting airborne with all that extra weight though. I am still postponing nestchecks on this rack due to the amount of babies ready to fledge and I have been unable to do a nestcheck on the other 2 units due to the thunder. 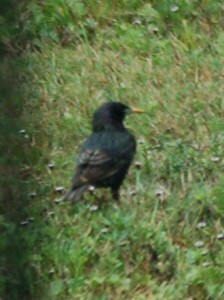 European Starling fledglings have come around, chaperoned by an adult. One was as close as a foot from the repeating S&S nestbox trap but never landed on the trap itself. Of course I was seriously disappointed and it reminded me that I must go back to Green Cay Nature Center to further observe the gourd rack there. My terrible luck with trapping this year along with the population explosion locally, has brought me to a new level of sadness for our native birds.